This four bedroom apartment is an excellent example of a home that exudes character and design. Using a color scheme of neutral creams, tans and browns, and contrasts of black and white, the look comes together very seamlessly and with total sophistication. 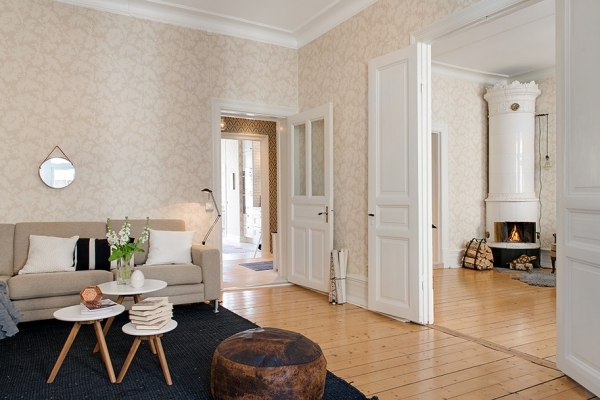 The use of patterned wallpapers throughout the home also gives it its own uniqueness and edge over homes who do not go near wallpaper. 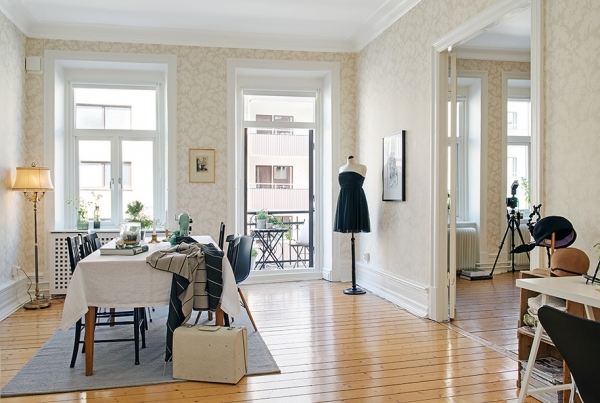 As you come into the living/dining area, you’ll notice that it is a very simple room. 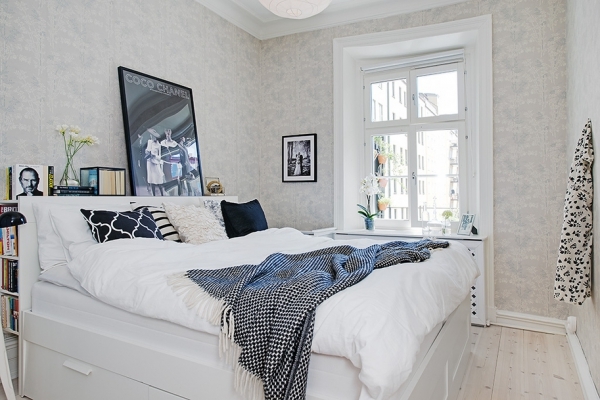 It has white and cream with contrasts of black, utilizing patterned wallpapers that do not overtake the room. 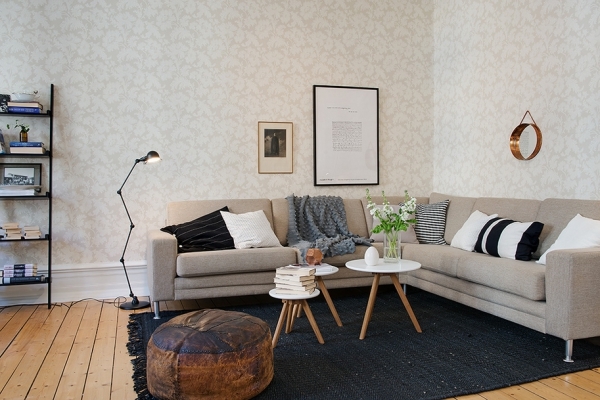 The same color scheme and airy wallpaper carries out into the living area, creating a nice flow between spaces. It makes for a very homely area; conducive to guests feeling welcome and comfy in the rooms. 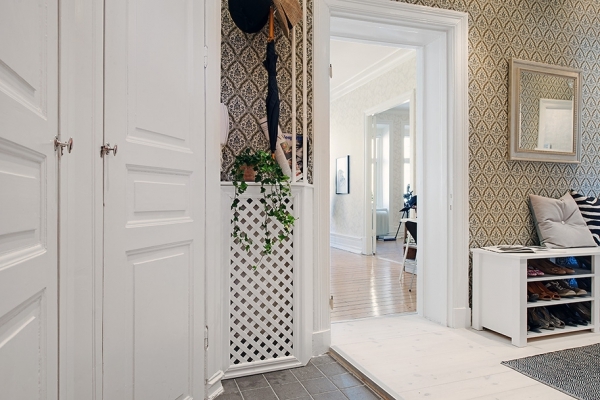 The hallway area uses excellent patterned wallpapers that contrast excellent with those in the living and dining areas. 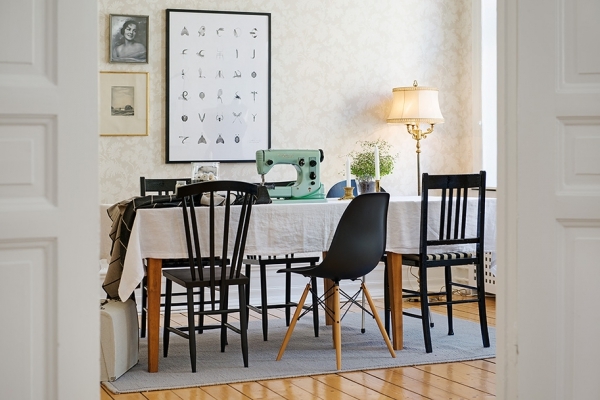 They are more dark and stand out against the white closet doors, paneling and furniture. 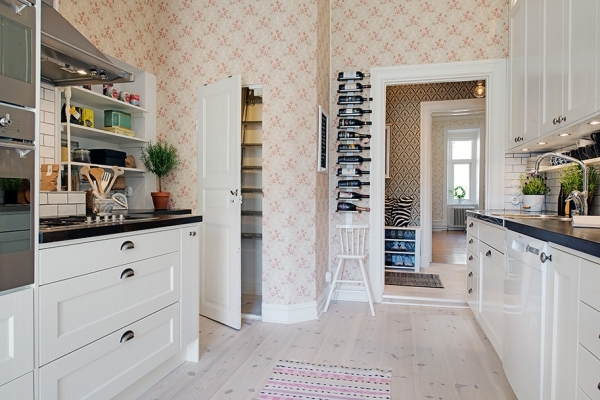 As you come into the kitchen you’ll feel right at home with the flowery patterned wallpapers and simple but comfy design of the space. 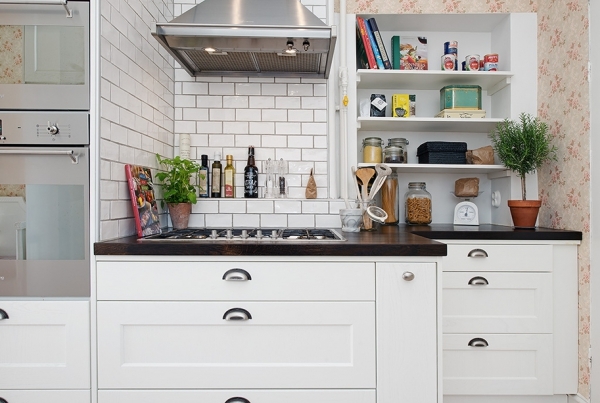 With simple white cabinets, counters, and tiling in the kitchen it brings a nice contrast to the lovely flowers of the wallpaper. 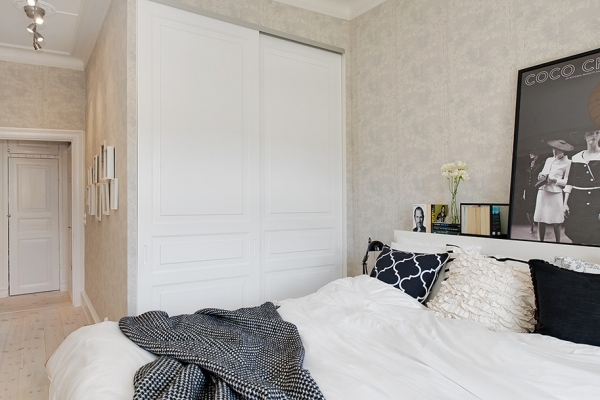 The bedrooms all use rather simple but beautiful patterned wallpapers; each using them more as a backdrop to the room or an accenting feature rather as a base for the decor. 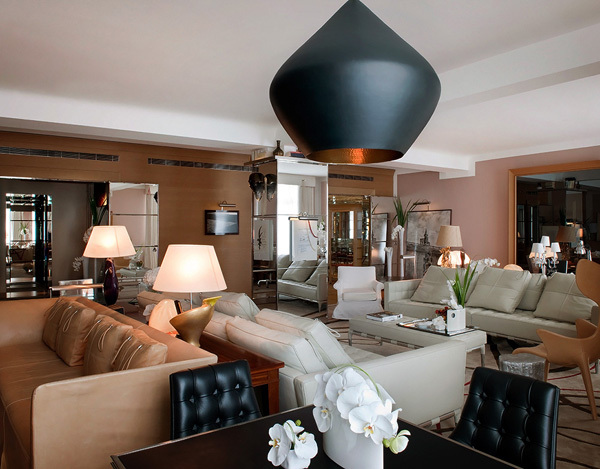 Each room has its own color schemes of different neutrals, whites, and blacks but with their own unique look. 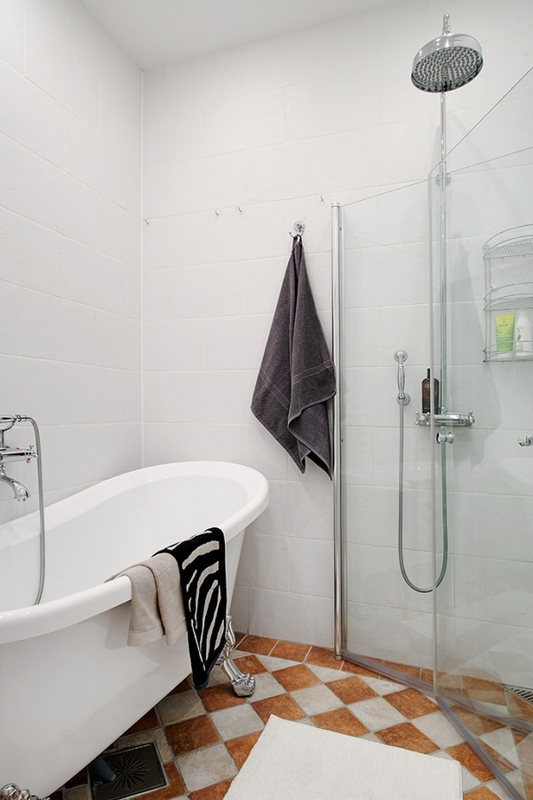 The bathroom is the simplest room in the home; all white except the diamond patterned floor. Still exquisitely done though. If you are considering using wallpaper in your own home, certainly go through with it, because it can look wonderful and bring so much to any room it is in.